I’m about to share both a quirk of mine and an awesome way to enhance what will hopefully be your already-kickass Thanksgiving dinner. No but seriously, that’s it. I don’t even remember how many years ago now I discovered that lemon on top of my Thanksgiving dinner was delicious but it is a tradition I will not forgo. If I have Thanksgiving dinner without freshly squeezed lemon juice on top of my turkey, stuffing, and [insert green here – usually broccoli], the meal is kind of ruined. I know, it sounds drastic. But have you ever squeezed lemon onto turkey or stuffing? Broccoli and greens are kind of a given (unless it’s something like green been casserole, which I wouldn’t eat, and then I can’t say for sure) but lemon juice on the dressing/stuffing is SOOOOOOOOOOOOOOOOO GOOOOOOOOOOOOOOOOOOOOOOOOOOOOOD. 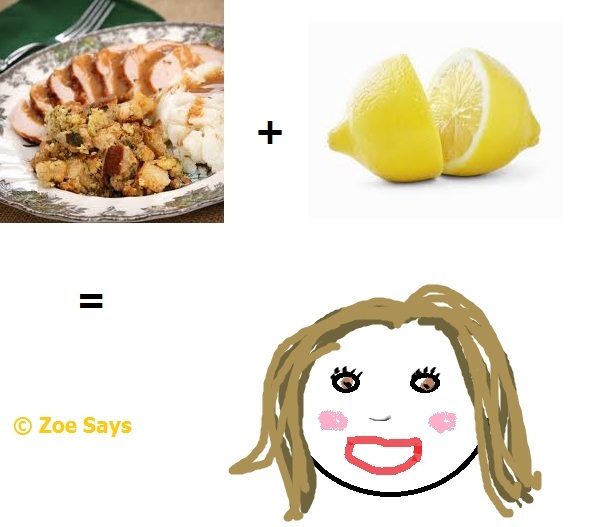 People like my mother and aunt think I’m a freak show and that the lemon is “ruining” the flavors of Thanksgiving. Nay! It just brings out all the delicious flavors and textures in my mind. But I have such a penchant for tart and sour flavors, which is why I love anything vinegary, as well. I have one or two friends who have begrudgingly admitted that it’s pretty dang tasty, which it is. But it’s not a Must Have for their dinners, whereas it’s do or die time when it comes to lemon and my holiday meal. What are your mealtime traditions? Any oddball ones like mine? Last but not least: Happy Thanksgiving!! « Who Decided Peppermint is the Flavor of Christmas? 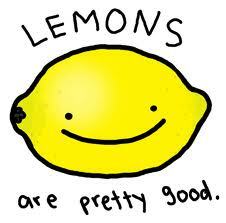 I AM GOING TO HAVE TO B-Y-O-L TO DINNER THIS YEAR AS I LOVE LEMONS TOO! ESPECIALLY IN MY DIET COKE OR A CORONA! NEVER WOULD HAVE THOUGHT TO SQUEEZE IT ON MY TURKEY, BUT GLAD YOU BROUGHT THAT TO MY ATTENTION TODAY! HOW HAVE YOU BEEN? I think you’ll find it’s quite tasty! Let me know how you like it for sure. I’m doing pretty well, year-end holiday stress notwithstanding haha. I hope you and the pups are doing great! I like shrimp cocktail on christmas morning. Is it the red cocktail sauce that makes it seem Christmasy?